In a Merseyside derby filled with questionable refereeing decisions, controversial incidents and eventually goals, it was Liverpool who ended the game victorious and Klopp’s side progress safely to the next stage of the FA Cup. The manager started a strong side but notably missing were Mo Salah and Philippe Coutinho, the former had just returned from receiving his African Player of the Year award in Ghana while the latter as I write this has just agreed a £142 million deal with Barcelona… sad times. Everton, predictably started the game in true Allardyce fashion, set up to protect and try to nick something on the break. Liverpool, on the other hand, retained a lot of possession in the first half but didn’t actually create anything with it until a penalty was awarded on 35 minutes. James Milner converted the spot kick, calmly as ever, but was it even a penalty in the first place? When I first saw it I definitely felt as though we were lucky to receive the decision, it looked very soft. However, what you have to ask yourself too is, was Holgate impeding Lallana? I think he was, I think he prevented Lallana’s turn to continue his run with the ball and therefore, hindered his attack illegally. Despite this, I still think Lallana went down very theatrically. With the benefit of replays and angles, I believe it was a penalty but I can see why it wouldn’t have been given. Shortly after the spot-kick, Everton’s Holgate let the red mist descend and pushed Firmino with both hands over the advertising hoardings and into the crowd, for no reason whatsoever. Firmino, rightly disgruntled at the situation, ran fuming back to Holgate and clearly an exchange of words occurred. I have no idea what was said and wouldn’t want to speculate but it truly baffles me that all on-air analysis and a lot of social media analysis was focused on the argument and what may or may not have been said. Not on Holgate’s ridiculous act to force Firmino off the pitch. Not long after the hour mark, Everton found themselves an equaliser, with the Reds caught completely off guard, an impressive break involving Jagielka surprisingly, allowed Sigurdsson to find the back of the net. After a brave decision to take Wayne Rooney off (obviously they didn’t want to give us the satisfaction of watching him get a red) I didn’t actually think the Toffees had enough left in the tank to find a goal. A period of improved pressure from the blue shirts though was enough to get them right back into the tie. Liverpool had to find a winner from somewhere, a replay would not be helpful with the number of fixtures already played and ones coming up in Europe. 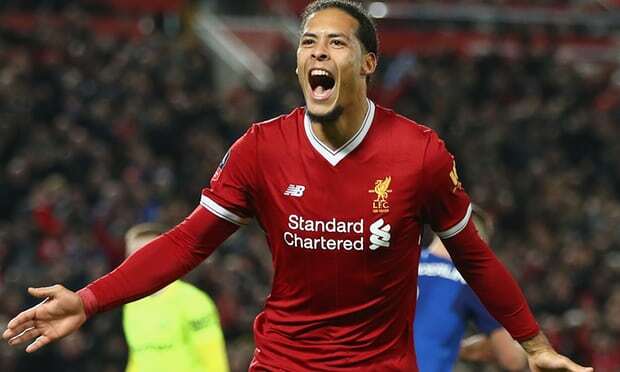 Step up Virgil van Dijk, the man from Southampton, so highly sought after for his defensive abilities and what does he do? Net the winner with a leap like no other against Everton to knock them out of the FA Cup in the 84th minute. Brilliant. You couldn’t write it as they say unless you’re Danny Murphy who predicted exactly that on the BBC prior to KO. It was a solid performance from the defender and the goal was simply the icing on the cake, I still hold my reservations but if you start your career at Anfield like that, you’ve got to be on to a good one?! Finally, I would like to highlight the performance of Andy Robertson. When Klopp bought him, I can’t say I was massively excited but I was definitely keen to see him play, it became frustrating when Alberto Moreno continued to be selected in his place and it’s a real shame in my opinion that it took an injury to the Spaniard for Robertson to get more regular game time. People argue that Moreno had improved and deserved to keep his place but I tried the whole giving Moreno a chance a while back, I stuck by him whilst others had already given up but for me, he’s just not a defender. Show me a reel of perfectly timed tackles from Moreno like the ones Robertson completed last night? On top of that, the lad has got a killer cross and is also extremely impressive on the attack. He was all over Bolasie yesterday and showed an impeccable understanding of the game, I for one can’t wait to see more of him.